Sorry, we couldn't find any INFINITI EX37 listings that matched your search criteria. Here are Nationwide listings for a INFINITI EX37. Here are our listings for all model years of the INFINITI EX37. 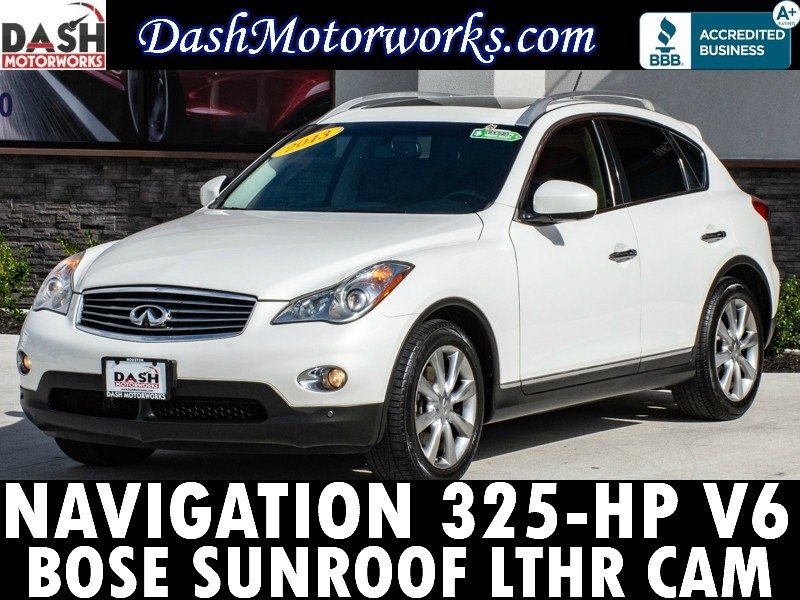 Sorry, we couldn't find any 2013 INFINITI EX37 listings that matched your search criteria. You might be interested in these similar years for INFINITI EX37. Avg. Dealer Rating: (7 reviews) "Outstanding sales person who listed to me as the customer and did what he could to accomodate me. I am extremely satisfied." Avg. Dealer Rating: (35 reviews) "What a great experience all the way through! Chris, Mike and Amira were all a pleasure to deal with! I love my new car and I love the level of service that they provide! " Avg. Dealer Rating: (29 reviews) "Great car. Didn’t have a couple of the features I wanted. Sale ladies were really nice and knowledgeable. " Avg. Dealer Rating: (15 reviews) "Eric Sudall was very helpful and I will probably do business with them in the near future." Avg. Dealer Rating: (57 reviews) "Prompt reply. Truck had features I didn't want, so never visited." Avg. Dealer Rating: (27 reviews) "Very polite and friendly. Set up appt. Drove Car. Have not yet purchased." Avg. Dealer Rating: (34 reviews) "Had just sold the used black scatpack i was looking for but a Mr.Paul Mauhe said he could get me a deal on a brand new scatpack and he did...highly recommended"
Avg. Dealer Rating: (69 reviews) "Not the greatest but not the worse the 2nd guy was better than the first one but they dont seem real determined to get someone a car so 3 stars"
Avg. Dealer Rating: (2 reviews) "for diffrence of $300.00 wouldnot take my offer . sad. granted they dId go dow but wats 300.00 wen you drop 1995. all i had was $9700.00 and seemed little rude cause kept negotiationg ...not everyone rich like sam...."
Avg. Dealer Rating: (22 reviews) "Would not discuss price of vehicle unless I was at the dealership. I lived over 100 miles away from this dealership"
Avg. Dealer Rating: (34 reviews) "Definitely 5 treatment." Avg. Dealer Rating: (12 reviews) "Very nice." Avg. Dealer Rating: (37 reviews) "I heard back quickly from Kelly after indicating interest in the vehicle. I followed up with specific questions and I didn't hear back from their sales contact, due to a technical issue which I found believable. (My email is easily misspelled and this can lead to lost messages). After a day or two I called the dealership directly and was connected with Bill. He was friendly and pleasant to talk to, and generally very helpful as we discussed financing and price. The only issue I had was that I was told that I had to go through their contractor to handle TTL because I was financing the vehicle, and the contractor's tax estimates weren't correct. I was told about this policy immediately, which I appreciated."